News: Apple has trademarked the design and layout of its retail stores, nine years after the first Apple Store opened in Virginia, USA. The U.S. Patent & Trademark Office this week published the tech giant’s latest trademark certificate, which covers the "distinctive design & layout" of the 400 stores worldwide, reports Patently Apple. The trademark consists of two designs, one in colour and one in black and white. 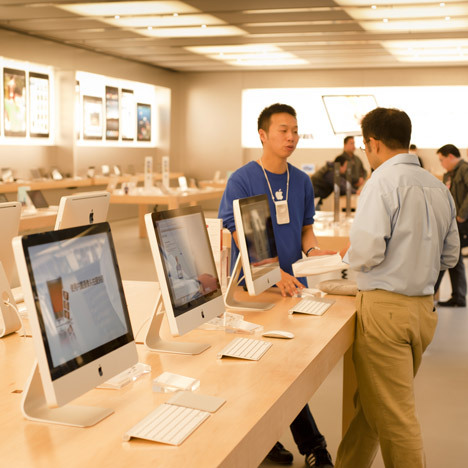 Both present the typical Apple Store layout, with wide tables in the middle and benches around the sides where customers can try out the latest products, as well as the Genius Bar helpdesk at the back. Steve Jobs, the firm’s late co-founder, and Ron Johnson, the company's former head of retail, are credited with the design and layout of the store. The first was opened in May 2001 in Tysons Corner, Virginia, but its now trademarked look was first introduced in Pasadena, California. Earlier this week we reported on proposals for a bookless library in Texas with a layout based on an Apple Store. Apple has been caught up in numerous patent disputes, losing its long-running battle with Samsung last year when a high court ruled that the Korean manufacturer's tablet computers were "not as cool" as the iPad. Another rival, HTC, also defeated Apple in a dispute over the use of swipe gestures in touchscreen phones. Copying is an increasingly important issue in architecture and design, with developers in China recently accused of pirating a building by architect Zaha Hadid currently under construction in Beijing. Plans for Hadid's Wangjing Soho complex were unveiled in August 2011, and the project is now racing to be completed before its copycat version.